Yesterday, the Superior Court handed down its opinion in Sackett v. Nationwide Mutual Insurance Company, 2010 WL 2837867, 943 WDA 2009 (Pa.Super. July 21, 2010 Allen, J., Colville, S.J., Cleland, S.J. ), which will likely become to be known as Sackett III. In the opinion written by Judge Cheryl Lynn Allen, the Superior Court held that the trial court correctly decided on remand that a vehicle was not added under a newly/after acquired vehicle clause in an insurance policy and the insurer should have therefore had the insured sign a new rejection of stacking form, in order for non-stacking to apply. According to the opinion the insured should have received a new stacking rejection waiver when adding a single car to a two car policy. Since the insured was not required by the carrier to sign such a rejection form, the Superior Court agreed that Mr. Sackett should be considered to have stacked UIM coverage. By way of background, Mr. Sackett was injured as a passenger while occupying another person's vehicle. He secured the tortfeasor's liability limits as well as the underinsured motorist (UIM) benefits limits on the vehicle he was occupying at the time of the accident. Mr. Sackett then sought to recover the additional UIM benefits available under his own policy with Nationwide. Mr. Sackett's originally purchased Nationwide policy had two vehicles under it but no stacking because Mr. Sackett had executed a valid waiver declining to stack coverage on these two vehicles. Prior to the subject accident, Mr. Sackett added a third vehicle to the policy at which point no new forms were signed regarding UIM or UM coverage or stacking. Throughout the process of going up and now back down the appellate ladder, it was asserted by Mr. Sackett's attorneys that he should be deemed to have had stacked limits because no forms in this regard were executed when the third car was added, i.e. he never rejected stacking. In Sackett I, i.e. Sackett v. Nationwide Mut. Ins. Co., 919 A.2d 194 (Pa. 2007), the Superior Court, as did the trial court, held that the Supreme Court precedent required that a new rejection form was required whenever a new vehicle is added to a policy. In Sackett II, i.e. Sackett v. Nationwide Mut. Ins. Co., 940 A.2d 329 (Pa. 2007), the Supreme Court modified the Superior Court's decision and held that requirement of a new stacking rejection form does not apply if a vehicle is added under a newly acquired vehicle clause and such a clause is present under the facts of the case. In the Sackett III decision handed down yesterday, the Superior Court agreed with the latest trial court decision on the matter and found that Mr. Sackett did not add any vehicles under the newly-acquired vehicle clause contained in the insurance policy. As such, additional rejection stacking forms were required and this requirement was not met in the case presented because Nationwide never had Mr. Sackett sign off on any new rejection of stacking forms when the vehicle was added to the policy. Accordingly, the ultimate holding of the Superior Court in the latest decision on this matter was that Mr. Sackett was entitled to stacking. The Sackett III decision can be viewed online at http://www.aopc.org/OpPosting/Superior/out/a14005_10.pdf. 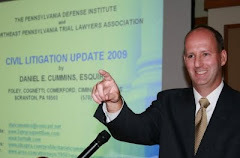 I send thanks to Attorney Scott Cooper of the Harrisburg, PA law firm of Schmidt Kramer for publicizing this Opinion and to Attorney Paul Oven of the Moosic, PA office of Dougherty, Leventhal & Price for bringing this case to my attention.